On the grounds of the Jacuzzi Family Vineyards is an olive press, above, where tastings are among the events. Photos from Jacuzzi Family Vineyards. Today, the focus is on some beautiful wines produced by Jacuzzi Family Vineyards. Remember that Posner Fruit Spread commercial, the one in which people fainted at the dinner table because – horrors! – someone dared to call it “jelly?” Well, that’s how territorial ancient wine regions can get about their wines. So territorial in fact, that long before the European Union was formed governments independently regulated the official recognition of specific wine regions, generally called “appellations” or “denominations.” A French vineyard might produce a sparkling wine but wouldn’t dare call it “Champagne” unless it was produced in the Champagne terroir (region) of France. The Champagne appellation is protected. By contrast, the tradition of appellations in the Americas is a relatively recent development. American viniculture itself is only a few hundred years old, as opposed to being as old as the dead Greeks and Romans. The U.S. government only began officially recognizing American Vinicultural Areas (AVAs) in 1983! 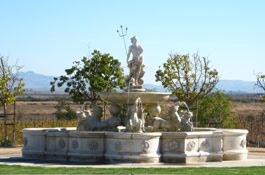 A Neptune fountain overlooks the vineyard at Jacuzzi. Why does this matter? North American winemakers do not face the same stringent restrictions as their European counterparts. No particular region is known as the dedicated terroir of a grape. If the soil can handle it, grow a Pinot in Napa, a Zin in Oregon, and then rip them out and try something else just for giggles. Well, probably not. Vine cultivation is not cheap and the grapes are more temperamental than cats. In America, it is entirely possible to specialize in hearty indigenous Zins on one side of the road and exquisite Italian varietals, including Sangiovese, Nebbiolo, Nero d’Avola, and the rare Aleatico, on the other. And thus continues A Tale of Two Vineyards. 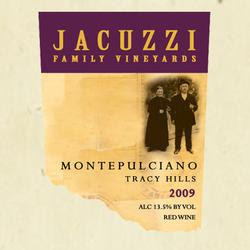 Named in homage to Frank Cline’s Italian grandfather (and yes, this is the same family behind the Jacuzzi tubs), Jacuzzi pays tribute not only to an Italian style of winemaking, but also to Italian varietals themselves. Many of the grapes come from grafts grown in Italy. Jacuzzi prides itself on making a true Italianate wine in America, hence the villa. The villa is not vanity; it sets the tone. Walking across the fountained courtyard into the foyer is like being transported to Italy without a passport. Don’t tell customs! Olive-tasting and a boutique store are off to the right. To the left is a generous tasting room with a truly knowledgeable staff. I especially recommend Fred Vallerga, whose love for wine and all things Italian sparked a second career; his pride in Jacuzzi wines is infectious. Detail shot of the label of the 2009 Montepulciano. The label on all Jacuzzi wines feature a photo of the grandparents of Frank Cline, the vineyard's owner. Jacuzzi’s Italian-style wines are quite different than Cline’s. Think about it this way –while a Zin will always have something of the wild mustang about it, Jacuzzi’s wines are cultivated thoroughbreds. Imagine wines that are far less fruity and sweet (dry). Keep the heartiness and watch carefully as different tastes suggest themselves long after the sip has gone (layers of complexity, long finish, heartiness). To this, add an immense respect for the grape – capturing the special characteristics of the varietals, either standing alone or blended into wonderful versions of classics. Do not even think of serving Jacuzzi wines with everyday pasta, pizza or leftover takeout. The wine will march out of the glass, go back in the bottle, recork itself, and sulk until someone who really appreciates its uniqueness coaxes it out again. Jacuzzi and Cline. Two entirely different approaches to wine. Two entirely different approaches to varietals. Several well-produced wines from one very small region, but don’t call it a terroir. What’s the moral of A Tale of Two Vineyards? For American wines, forget the issue of terroir. If the wine drinks well, what’s it to ya? Next time: Sake for its own sake. 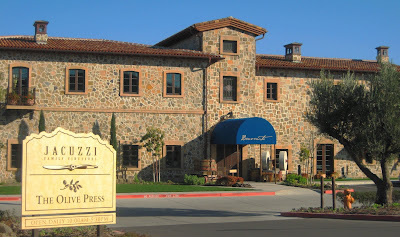 Learn more about Cline Cellars at http://www.clinecellars.com/, and Jacuzzi Family Vineyards at http://www.jacuzziwines.com/. Both vineyards ship to most places throughout the United States. For international shipments, contact them directly.